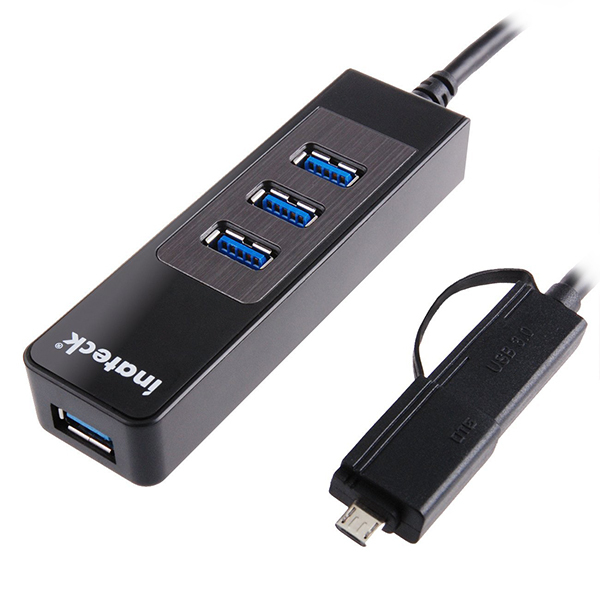 This is a 4-port USB hub, featuring USB 3.0 ports, and the added feature of including a micro-USB adaptor. The micro-USB adaptor allows you to use the hub as an OTG device on Android devices, while it allows you to use this as a general hub on most Windows 8 tablets. Much like most USB hubs, there isn’t probably a lot to tell about this. A sleek build features 3 USB ports on the top, and another one on the far end. The other end features a USB cable, with a special adaptor attached physically to it by a rubber string (loom/cable?) for your micro-USB connection. USB 3 is slowly making its way into laptops. As of now, most laptops I see being sold only feature one or two USB 3 ports, while other ports often are USB 2.0 only. USB 3 offers much faster transfer rates, as well as more current output for the ones among us who use our computers to charge our phones. 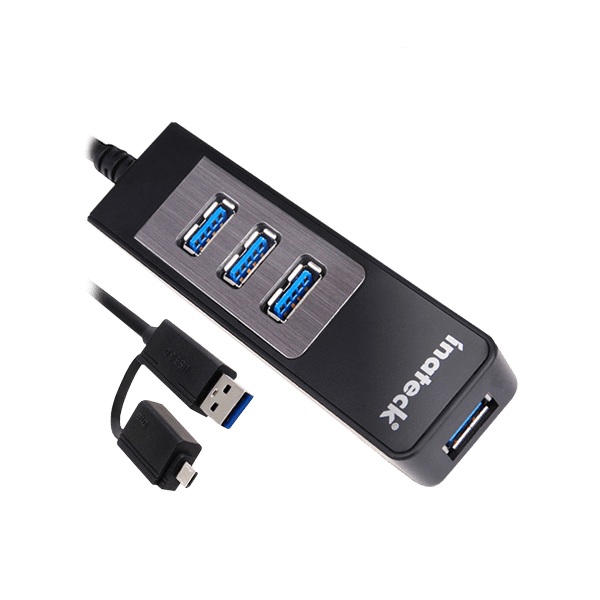 This means that having a USB 3.0 port lets you get all the advantage of USB 3.0 ports from just one USB 3.0 port. Of course, if you plug this into a USB 2.0 port, you will only go up to USB 2.0. This is because the joy of digital communication is that you are only as fast as your slowest connection! It works as simply as you would expect it. Plug it in and it installs itself. After that, just plug things in and off you go. The top 3 USB ports are placed closed together, but the one far away means you can connect awkwardly shaped USB drives as well. With more and more Windows 8.1 (and others) tablets coming into play, we keep seeing micro-USB ports on them instead of a proper USB 3.0 port. That means that this USB hub can actually give you 4 ports on a standard Windows tablet. Definitely worth the money! Also called OTG (on the go), this feature can also be used on Android tablets and phones, where it is supported. Hence you can plug in a USB drive with films, pictures, etc and use them on your tablet, without having to take up any space in the device of your choice. It generally retails for £42.99, but at the moment, it is going for £13.99, which makes this an immense deal! A brilliant device, specially with the ability to plug this into the upcoming tablets. The USB 3 is absolutely the minimum speed you should go to these days, and with the added deal on Amazon, there is no excuse to hold back. At that kind of price point, you really can’t go wrong with this hub can you? It seems small enough that you can throw in to a bag if need be, and getting this kind of USB 3.0 expandability at under £14 is a steal. Assuming I didn’t have the Belkin Thunderbolt Express Dock on my desk, I think I’d buy this, haha! Yeah, at that price there is no competition. Of course, whether that means that it is about to go out of stock to be replaced or get back to its old price, we cannot say.